Marine animals aren't big on body language. Instead, they use sound to communicate. Some use sound to hunt, engaging echolocation to find and sometimes to stun their prey. Sound travels differently through water than it does through air, but water serves as an effective sound-carrying medium. Marine animals rely mostly on sound to communicate with each other. Whales and dolphins, for example, are capable of making a complex combination of noises such as clicks, whistles and squeaks. Whales also make noises described as song, with changes in tone and pitch, that can last 20 minutes or more. Marine animals seem to recognize the voices of family members and other animals of the same species. If they're swimming in the top few feet near the ocean's surface, marine animals can see well in the water. As they dive, the light dwindles to little or none. Even with eyes designed to see in low light, the animals' sense of sound becomes much more important. Sound helps family groups stay together or find each other if they get separated in the depths, for example. People hear sound vibrations as they travel through the air, but marine animals can hear sounds from much farther away because sound travels better through water than air. According to Woods Hole Oceanographic Institution, sound moves five times faster through water than air. It also tends to travel farther through water, allowing marine animals to talk to each other over great distances. Their noises are specially designed for underwater travel, which means they don't sound the same if made above water. 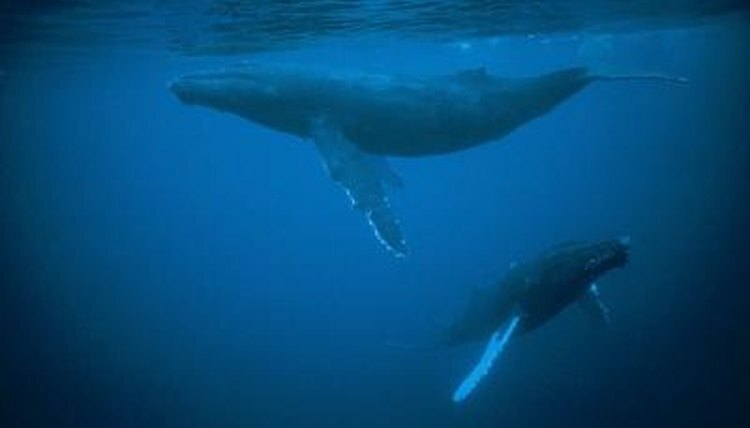 The ocean might seem peaceful full of whale song, but it's full of other noises that can interfere with animal communication. Natural interference comes from phenomena such as earthquakes or thunder, but human interference can be more dangerous and it's more widespread. A submarine using sonar for navigation causes underwater noise, as does oil drilling in the ocean and ship traffic. To help protect underwater animals, some groups are altering their practices. The U.S. Navy, for example, turns off its submarine sonar if it spots marine mammals nearby, and tries to alter ship routes to avoid known marine mammal migratory patterns. Woods Hole Oceanographic Institution: Marine Mammal Vocalizations: Language or Behavior?